The Institute for Polish-Jewish Studies (IPJS) was established in 1984. It is a non-profit, educational institution devoted to the history and culture of Polish Jewry. It is an associated institute of the Oxford Centre for Hebrew and Jewish Studies. The IPJS is best known for the publication of the yearbook Polin. Studies in Polish Jewry, edited by world renowned historian Antony Polonsky (Brandeis University) and published by the Littman Library for Jewish Civilization, Oxford. In recent years, volumes have been dedicated to the history of the Jews in Cracow, and in Lithuania and in Ukraine. Polin: Studies in Polish Jewry publishes original research by leading scholars from a variety of disciplines working in the fields of history, literary criticism, history of the Holocaust, and the history of Jewish-non-Jewish relations. The Institute of Polish Jewish Studies has hosted a number of significant public events, with the yearly conference to launch the new volume of Polin: Studies in Polish Jewry being the most important. These events have been held in cooperation with the Embassy of the Republic of Poland, and the Polish Cultural Institute, London. The IPJS cooperates with the Polish Cultural Institute, London, the Institute of Jewish Studies at University College London, and the American Association of Polish-Jewish Studies. Public events devoted to a variety of topics are organized throughout the year. These events focus on the rich and variegated history and culture of eastern European Jewish communities, as well as the Holocaust. 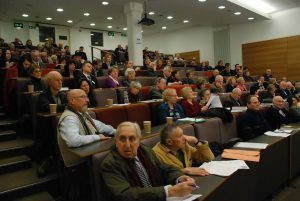 Members of the Institute of Polish-Jewish Studies engage actively in academic research and education, and are frequent public speakers on the history and culture of Polish and eastern European Jewry, as well as on the history of the Holocaust.